Tucked in the centre of Budapest, E-Exit is a pretty chilled kind of escape room. As soon as you walk down the stairs, there’s something very laid back about the experience – from the greeting to the sofas, this is a venue that’s comfortable in what it’s delivering. And what it’s delivering is solid games. 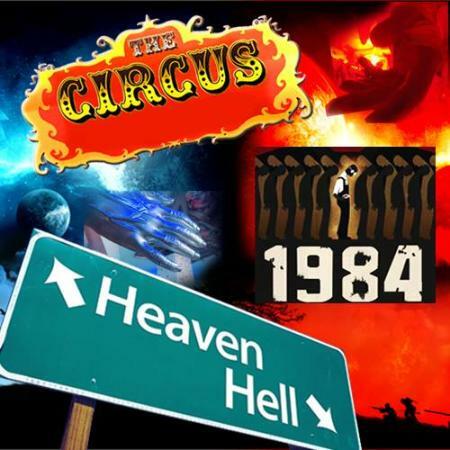 1984 and Circus are both reasonable experiences with good, logical puzzles and interesting theming, but the stand-out, by a very long way, is Heaven & Hell, which combines great puzzles, great looks and a story that just keeps giving. Since visiting, they’ve added one more game to their line-up, Santa Muerte and, while I know little about it, I’d definitely be signing up if I were to be heading back. On paper, this was the room that really drew me in but, looking back, it kind of had a theme and kind of didn’t. 1984 (the book) certainly has an overarching military theme, and this room took that on board, but there’s nothing that really stood out. Perhaps I was spoiled by the London-based Enter the Oubliette, which managed to convey the oppression of the book in so many ways, but I felt there could have been a lot more here to progress the story. To some extent, they did get across a feeling of being confined without actually being in prison, so perhaps there was something there, but nothing that really added to the room. The puzzles whizzed by and, of the rooms I played in Budapest, these ones seem less memorable in spite of the presence of some physical challenges. There were certainly a couple of good puzzles, but relatively little that I found exciting. One left us frustrated for a significant period because we didn’t have all the clues necessary to complete it. I’m never quite sure whether that’s the fault of the player or the designer. Does the designer really have to telegraph every time you’ve got all the pieces? If not, though, how is the player meant to tell the difference between a really hard puzzle and one for which not all the pieces are available? Perhaps the answer is that the game host will point you in the right direction when you’ve been stuck long enough. Personally, I find that unsatisfying. There’s one particularly cool moment in this game, but it’s only experienced by one player, so it’s worth thinking carefully who deserves that privilege. You can always even up the score over in Heaven & Hell. Overall, it’s a solid room with nothing that’s amazingly frustrating but also nothing to get particularly excited about. In another city, it might be on my to do list, but in Budapest with its tens of games, I’d probably give it a miss. Circus is a quirky kind of game that tries to convey all the fun of the carnival through decoration, games and props. On occasions, it accomplishes this well, with some fun challenges that fit the theme. However, at other times it felt a bit like a slightly dilapidated circus attraction that wasn’t much fun to be in. One particular frustration was the use of cuddly toys to represent some of the circus animals. This was almost certainly a humorous idea when it first opened but, after a couple of years of players kicking them around the room, you just end up with a lot of grubby toys. If you’re the sort of team that likes to parallelise your solving, then you’re in for a treat. Apart from a small bottleneck in the middle, it felt like there were plenty of opportunities to work separately. Indeed, I missed out on huge swathes of the room as I focused on a couple of fun physical challenges towards the start, something that I think is inevitable if you go as a larger group. If you’re only playing one or two games, that provides a great opportunity for a post-game chat but, as we were rushing around from game to game, it meant that I missed out on those experiences entirely. A couple of other frustrations towards the end of the game let down the promising start with a puzzle that wasn’t properly reset and one whose unfolding resulted in a very tedious search. Minor gripes perhaps, but each contributed to us losing the initial rush before we reached the end of the game. The finale wasn’t the most exciting in the world – no great reveal, just a slow crossing off of puzzles until we’d got the final piece we needed to escape the room. Heaven & Hell is an ambitious game in many, many ways. Firstly, it has a huge number of transitions as you battle your way into the after-life and back. It’s hard to build a coherent room with such relentless pressure to move on, but they managed it here. I never felt we were being forced onwards too quickly or that we were short of puzzles to work on. Secondly, there were lots of really cool mechanics in the game. Not in the sense of automation but just in the physical changes within the room that worked well both as puzzles in their own right and in progressing the narrative. Which neatly segues into the third ambition here: they really did tell a story, although not by giving us a detailed account of what happened but by conveying the sensation of what we were doing. While I wasn’t sure why we needed to get into the afterlife and back, it was clear that each of the rooms we played represented a step on our journey. At times, this room was dark (and not in the lighting sense). At times, it was whimsical. Sometimes, I wasn’t even sure which it was. Throughout, though, it was a delight. Puzzle after puzzle was logical. Some were easy. Some were complex. Some required teamwork, others good communication. There were several that were physical. All of them, I think without exception, were fun. The game starts the way a game like this should start and finishes exactly how it should finish. If you get the chance to play in Budapest, make sure this game is high up your list.